Back in summer last year (2017), we ran the Active 10 campaign on behalf of One You Hounslow to tackle inactivity in the borough. It encouraged people to sign up to the campaign, so they could receive more information about local walking opportunities – active travel, walking routes, parks and walking groups. Afterwards they received a series of behaviour change emails where they were encouraged to download the free Active 10 app, received details of the walking routes and groups and also useful tips about getting active. 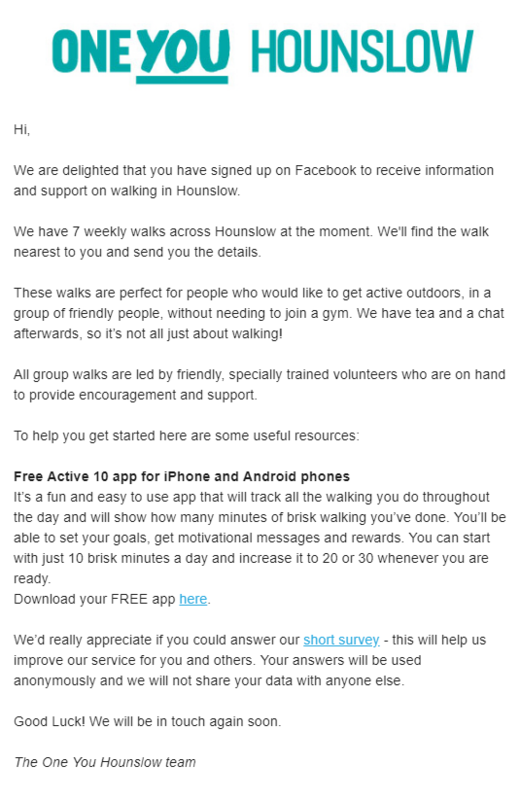 Although over 1000 people signed up, One You Hounslow didn’t see the uptake in walking groups they wanted. We developed a new approach and ran another campaign in January this year where we got people turning up to the walks. Here’s what we did. We ran the campaign for a few weeks in January, a time of the year when people set new year’s resolutions and have a strong desire to become more active. 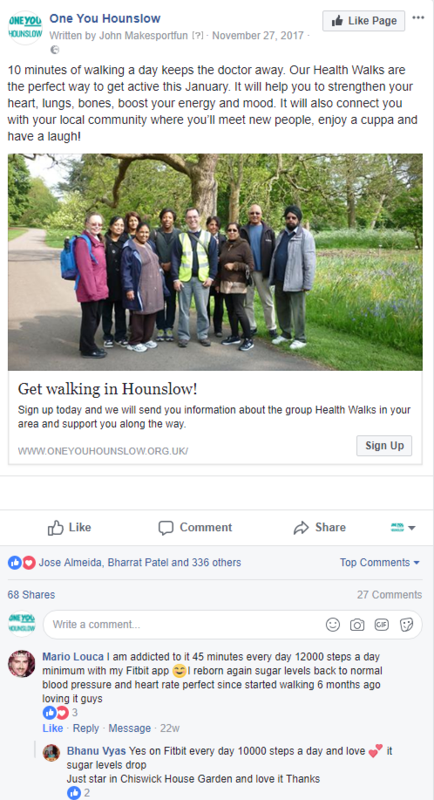 With a £600 ad budget we reached more than 14,000 people living in Hounslow and 213 of them signed up to receive more information about the health walks. 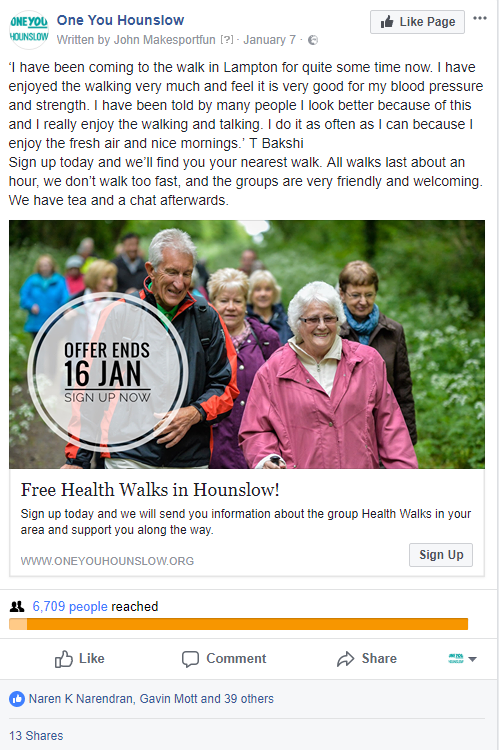 We wanted to reach all over 55s interested in health walks so we used Facebook’s core targeting by age, gender and location. We had an offer we knew people liked. We used images of people our audience could relate to. We wrote a few lines of copy about the group and benefits people will get by joining it. We included a Call to Action, the next thing we wanted them to do. Once the campaign started we had to deal with all the enquiries that came in! We made sure that we followed up with people as soon as they signed up. No matter what time someone filled out the lead ad form, we wanted them to get a confirmation letting them know that they have registered successfully. Therefore, we set up an automated confirmation SMS message and email that people received immediately after signing up. We collected people’s postcode when they first signed up, so we could check which walk was the nearest to them and we sent them an SMS message with the details. Around 10% of people attended the walk after hearing from us once. To increase that number we kept in touch with people for the next 3 weeks. One day before the walk we’d send an SMS message reminding them about it. People really appreciate this support. We all know how busy everyone’s lives are and even though we have every intention to get active some other things get in the way. By following up for 3 weeks after the sign up we managed to increase the attendance to 22.5%. We wanted to know how many people actually attended a health walk, so we analysed the new walker forms as well as sending an SMS survey to everyone who registered. 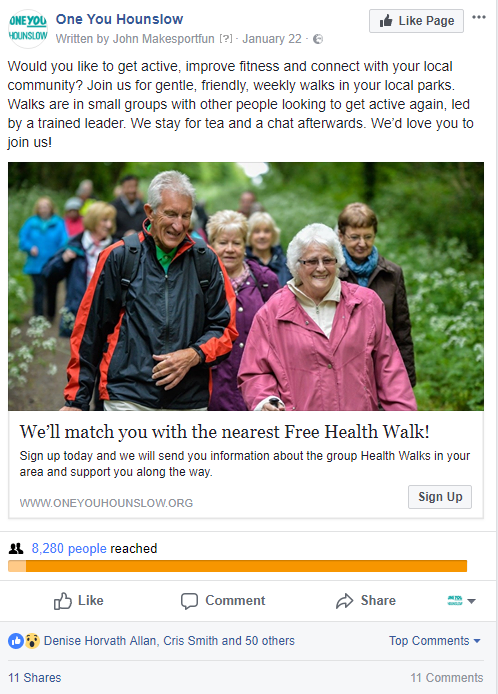 The health walks monitoring forms showed that out of 28 new people 26 came from Facebook. That’s 93%! The SMS survey had a great response, 52% of people replied answering yes or no. Whereas if you survey people by email you can only get on average a 10-15 % response. 22.5% of people said that they attended a walk. Based on this around 50 people attended at least one walk in January and February so far! This number is higher than the new walker forms suggest – which tells us that there are probably new people turning up who aren’t filling in new walker forms. Daniel is currently Public Health England’s marketing manager for London, managing PHE’s relationships with key non-commercial partners in the capital, including all 33 London boroughs, the NHS, the GLA and London Councils. He has been responsible for developing and running digital marketing campaigns among other things. One Facebook ad campaign they ran outperformed TV by 9:1! If you’d like to hear the interview with Daniel then click this link to get the replay.